Used to be, if you wanted to experience FPV (First Person View) flight, you had to piece together a system yourself. Once you did, you then had to figure out how to make everything work together. 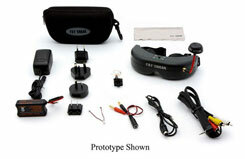 The Spektrum VS1100 Ultra Micro FPV System eliminates all the guesswork by giving you everything you need in one box. Camera, headset, batteries, charger - it�s all there, all compatible and can be ready to go in minutes. One of the coolest features of the Teleporter V4 headset is digital head tracking. Digital head tracking lets you look around the environment your model is flying through without the extra weight and complexity of a mechanical camera gimbal. Special sensors and software in the headset allow you to pan and tilt your field of view using the fixed-position VA1100 camera that�s included. It�s just one more way this Spektrum FPV system lets you have more fun with fewer hassles.